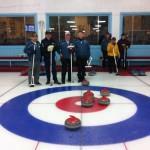 The Amherst Curling Club, Men’s League, completed the final Round Robin Play on March 10th for 2014, with the team of Ray Fowler, Brian Faught, Andrew Polegato and Geoff deGannes winning with a 5-0 record. Second place went to the team of Paul Hawkes, Nick Porter, Rob Lemoine and Drew Polegato with a 4-1 record. Next week’s play is the Annual 2on2 event to close out the season.